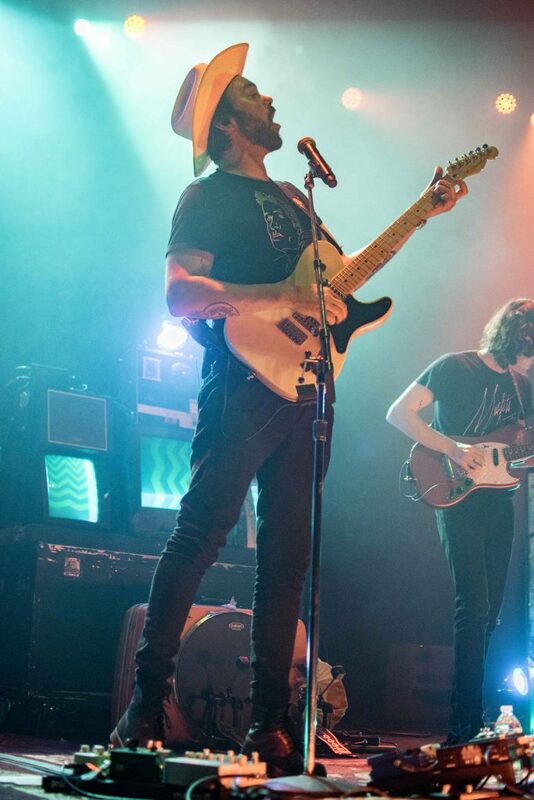 Originally the stage name for singer and guitarist Alejandro Rose Garcia, Shakey Graves has morphed into the four-piece, indie blues-rock band that took the stage at the Vic on May 22. Since signing with the Dualtone Music Group in 2014, Rose-Garcia has diversified his sound by adding more artists and instruments to his famous one-man guitar and suitcase act. 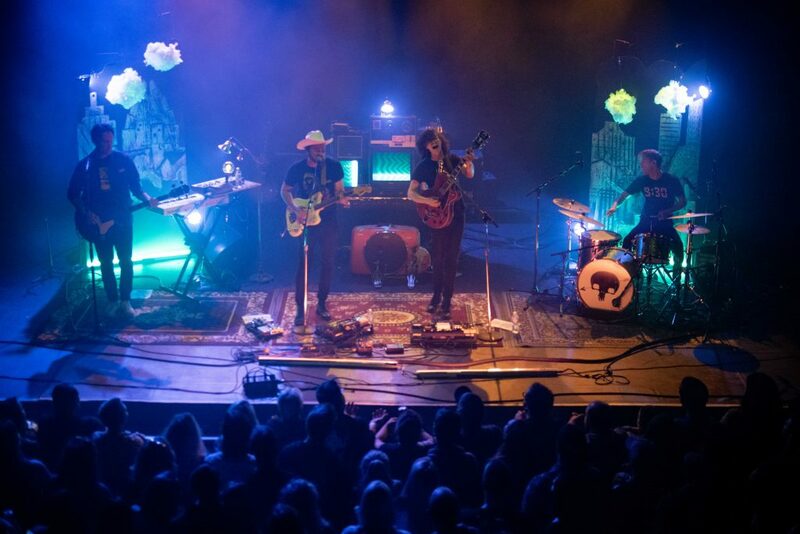 His latest release, Can’t Wake Up, softens his upbeat Texan twang into a more whimsical, introspective rock set that relies less on Rose-Garcia’s showmanship and more on the depth of both his lyrics and his band. Despite Rose-Garcia’s constantly expanding sonar vocabulary, his music—and stage presence— is still very uniquely his.Everything down to the construction of the set was overseen directly by Rose-Garcia, who darted around stage in a horned skeleton mask setting up props and instruments according to his liking before the performance. In keeping with the theme of Can’t Wake Up, the stage was set up as a Tim-Burton-goes-punk-esque dreamscape. Cotton ball clouds floated over an eerie, black and white city scape as cartoon sheep jumped between them, creating the ghost town of your best childhood nightmares. In the center of the setting was a conglomeration of outdated radios and televisions, playing a loop of cartoon static. And right in the very middle of the stage was Shakey’s iconic suitcase outfitted with a kickdrum and tambourine. Traditionally, the stage going dark signals that the performance is about to begin. The audience anticipates the music to begin with a flash of light, the band storming the stage and commanding attention. It was surprising, then, that when Rose-Garcia walked on stage (this time without his mask), he was accompanied only by a soft, purple glow from the wispy clouds surrounding him and the static from the TVs behind him. From the audience, only his outline was visible. He slowly strummed his way into “Only Son” off his 2014 album And the War Came, which marked a transition point where Rose-Garcia branched out from his solo act to collaborate with other artists. This song, however, nodded to the old Shakey—just Rose-Garcia and his guitar, sitting on his funny little suitcase, having a blast. Each successive song added a little more depth to the set. The next one, “Foot of Your Bed,” invited the rest of his band on stage, linking the old with the new. I didn’t realize until the third song that the stage had been getting progressively lighter, the deep purple of the clouds lightening into pinks and oranges, the lights at the base of the stage flooding it with a soft luminescence. The sun was rising on Shakey’s ghost town, and Rose-Garcia was ready to greet it. The additional bodies on stage brought more energy to the set, and soon both the band and the crowd were dancing around to the rock-n-roll rhythms designed for this four-piece group. 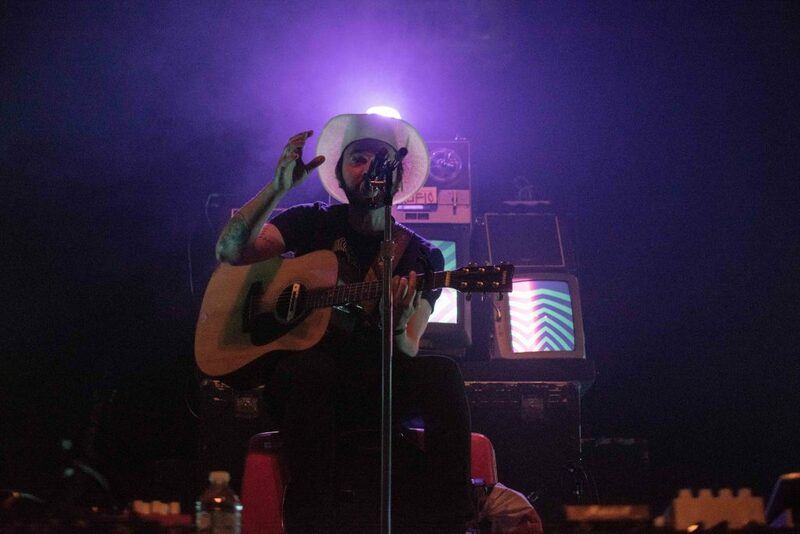 Rose-Garcia swapped his acoustic guitar out for an electric one and popped on a cowboy hat, only to swagger around in a wide legged stance and mime his own lyrics. In true Southern fashion, he was in no hurry to do anything but tell tall tales and enjoy himself. The set was like a midsummer day dream—the sun rising lazily, heating up the ground and thickening the air until the clouds can’t take it anymore. Then they burst open for a late afternoon thunderstorm—or, in Shakey’s case, another solo bit where Rose-Garcia poured his heart out onto a six-string. He played several older songs, encouraging the audience to join him in his reverie, before parting the clouds for one last sunset. The band came back on stage, kicking up their heels to some of their more country-inspired pieces as the lights slowly reddened and dimmed. The final song that they played as a group was “Counting Sheep” off their latest album. At last, the sun had gone down on Shakey’s fantastical ghost town and it was time to rest. 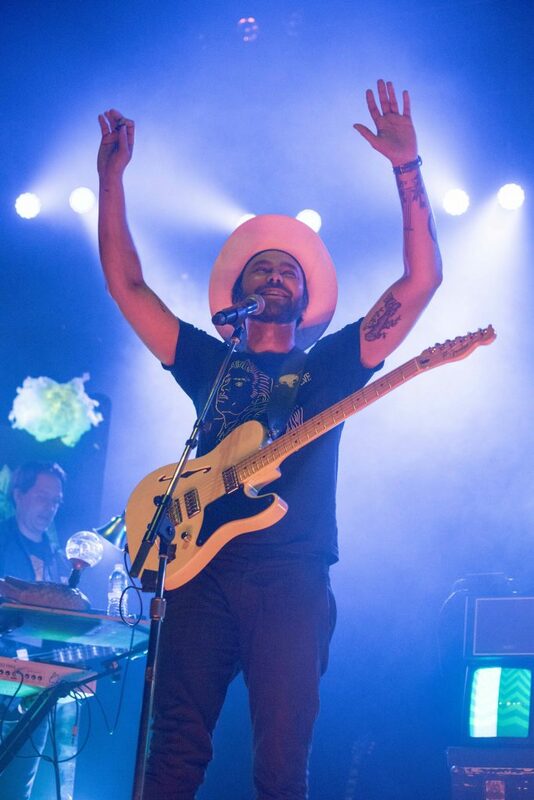 Rose-Garcia remained alone on stage under a spotlight to close the set with two of his most famous songs, “Roll the Bones” and “Late July.” Behind him, a retro-inspired sign flashed “Shakey Graves,” reminding the audience that at its core, Shakey Graves is the project of one scrappy little kid from Texas and his guitar. Even with the addition of other voices and talents, the two are inseparable.